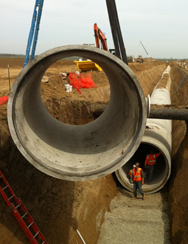 Mozingo Construction specializes in underground utility projects of many sizes and of any complexity. Our primary expertise is installation of wet utilities which include sewer, storm drain, domestic water, recycled water and major irrigation pipelines, pump station construction and other related mechanical work. Additionally, we perform dry utility work on select projects including gas mains, electrical and communication ducts. Please visit our Services Page for a complete overview of our services.